The old name was 'Bobby Movie Box'. 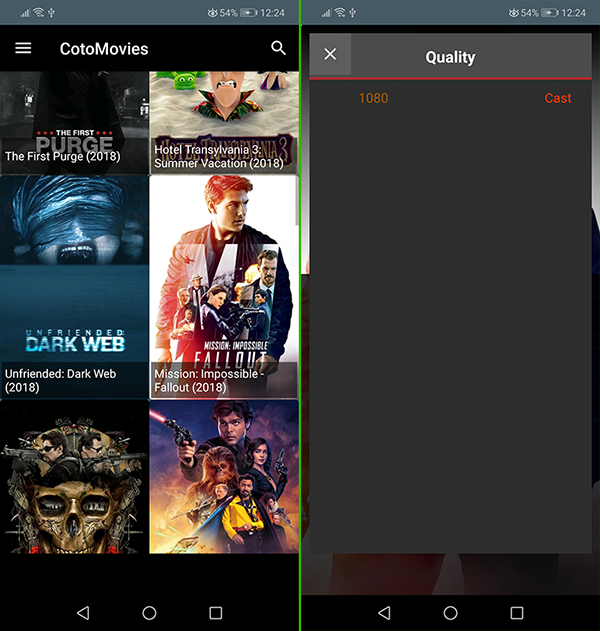 Now, it's called 'CotoMovies', an application for watching movies and TV shows on Android. This application offers the latest movies and TV shows with full HD quality from multiple global servers. What makes this CotoMovies special? Of course there are many applications that streams movies and series, including those that we had addressed in previous blog-posts. However, this application is very unique in multiple aspects. In terms of speed, it is very fast, enough to choose a movie and present different sources to broadcast the movie on your device without leaving the application and in a short time. Also, it is easy to choose any language subtitles supported by the application player. Just click on the translation icon, and choose between downloading the subtitle file from your phone or download it from Internet. CotoMovies does also support Chromecast. A very useful and practical feature to watch your movies on TV. Of course the app is not available in Google Play, but you can click here to download it: CotoMovies.